Capture and record audio and video calls made on Skype. Is there a better alternative to IMCapture for Skype? Is IMCapture for Skype really the best app in Chat category? Will IMCapture for Skype work good on macOS 10.13.4? IMCapture for Skype (was SkypeCap) captures and records audio and video calls made from Skype. 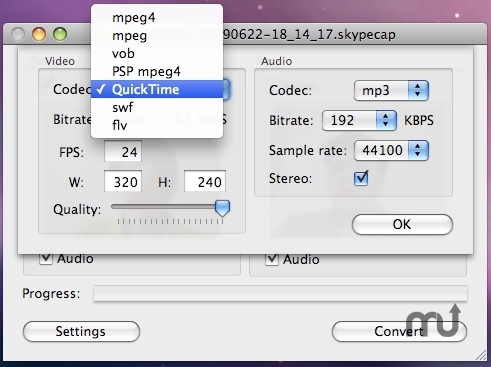 Recorded audio calls are saved as MP3, WMA or AAC files and video calls as Quicktime Movies (MOV), MPEG4, MPEG, VOB, PSP MPEG4, SWF and FLV. Calls can be replayed, shared, archived, or studied. SkypeCap is valuable for business, a practical tool for everyday and very easy to use. Get a free trial version of IMCapture for Skype today. IMCapture for Skype needs a rating. Be the first to rate this app and get the discussion started! Wouldn't you love to stop time and take a minute to catch up? It's nearly impossible to take notes during a call session and keep up with the conversation. Stay in the conversation and keep the discussion moving when the Skype call is recorded with IMCapture. Do you wish you could be in two places at once? With IMCapture call recorder software you can make that 3pm sales call in person and not miss a word of the 3pm conference call. When the Skype conference call is recorded and saved with IMCapture, you simply watch and listen to the recorded call later, when it's convenient for you. Skype calls recorded with IMCapture for Skype can be referenced again and again. Video and audio calls are saved and can be converted in into several different file formats. Use the saved calls to hone your phone presentation skills. A saved conference call can be distributed to anyone who missed the original call. Sales calls and interviews can be saved and more carefully reviewed later. IMCapture for Skype records your Skype calls for you. It's so easy now to record your call, listen to it later, and save it forever. Download IMCapture for Skype today. IMCapture for Skype is a valuable business tool. IMCapture for Skype is great for personal use.